I’m sure someone else will bid by the time it’s over but I’m pretty sure I don’t want to deal with this guy. He seems to think he can just come, pick up the car, and leave, as if I don’t have to print out all these DMV forms and get it smog tested and all of this other crap. I know Garfield comics sort of repeat themselves, but damn! Posted on July 28, 2006 7 Comments on Yeesh! I made another batch of melonpan. 15 buns. It came out different but that’s a good thing I think. I’ll be bringing it to James’s shindig tomorrow! Posted on July 27, 2006 Leave a comment on Wowsers! Oh and since I linked my dad’s new blog, I’ll link the project my mom’s working on – Kaballah Matching. Using Jewish mysticism for matchmaking purposes. No RSS feeds or LJ syndication or any mumbo jumbo like that, but it’s worth a look. Cheggidout. I made Melon bread! It’s the tastiest bread ever – it’s a dessert bun, sort of like a donut, but it’s not fried. 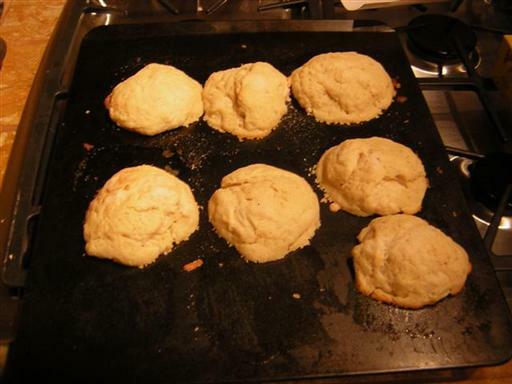 They look like biscuits or cookies, but they’re really rolls. 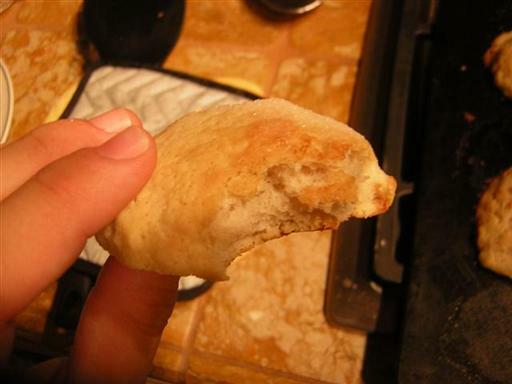 They have a slightly crispy cookie-like exterior, but a soft, fluffy interior. They’re AWESOME. And despite the name, they often have nothing to do with melons – I flavored mine with vanilla. Posted on July 26, 2006 15 Comments on Melonpan!!! Just as important as my car on sale! Jon’s going to totally shack it up with Liz! Supposedly it’s a permanent change! This is a story element that started last week and carried over to a Sunday strip, so it’s heavy duty. We were totally calling this Jon and Liz and Liz’s date and Ellen thing earlier in the week. Yeah we hate Garfield, but you can’t really HATE Garfield. Come on! Posted on July 25, 2006 9 Comments on Just as important as my car on sale! I have put my car, yes, the car in CAR, up for auction on eBay. Bidding starts at $500. I wrote a hell of a lot about it for this auction, so take a look. To think, this car will be gone in a little over a week! But I am moving on. Posted on July 25, 2006 11 Comments on Aaaaaagh so frightening. Hey so for anyone interested in trusted computing you should check out my dad’s blog. He’s a software engineer at Sun who’s been working on Solaris Trusted Extensions for quite the long time. You can also subscribe to it through gfaden! Well Comic-Con comes to a close for me and it leaves somewhat of a disappointing taste in my mouth. Right next to the taste of some awesome sushi that I treated myself to for dinner. Wednesday was driving to San Diego and stopping off at the con for badges and a peek at the dealer’s room and that was about it. Thursday was let’s buy everything day where I got a few posters and a girly book. I walked around aimlessly a LOT but saw pretty much everything on the floor. I followed the Dayfree Press gang to the mall and that was about it. Friday was let’s go to panels the entire day day. I went to Blank Label, Dumbrella, Keenspot, and Scott McCloud panels – all quite entertaining. In the evening I went to Spike and Mike’s Sick and Twisted Animation Festival, the “gauntlet run,” where people booed off stuff they didn’t like. They seemed to not like anything with words, or from France/Canada. Blood was a big hit. Saturday was I’m exhausted so let’s waste a day day where I sat around and played Nintendo DS with people at the booth. 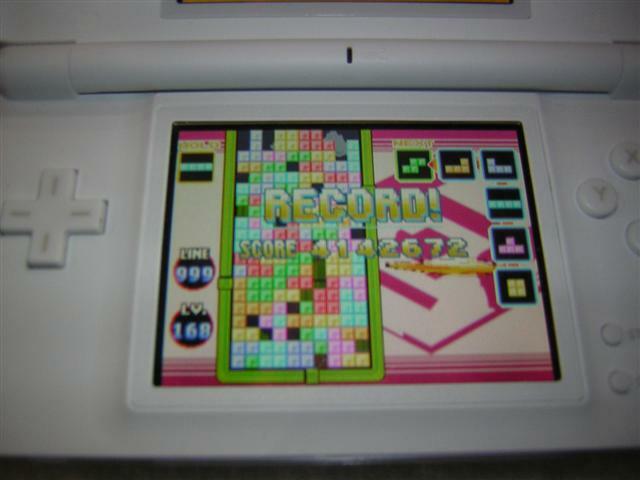 I also got this massiv high score at Tetris which took about two hours out of my day. Stupid enough, I played some DDR Universe and SuperNova, then went straight outside into the blistering heat and walked for about 10 blocks. I was hungry, thirsty, hot, tired, etc… but fortunately at the end of my trek was some Jamba Juice. Then I ran through this water fountain thing for a while. I pretty much missed most of the panels I planned on going to, and I returned back to the hotel room relatively early (here I am!) to um, blog. And see if Paolo was around. Gosh I’m a bad friend, and it’s all because I was making time for stuff that wouldn’t happen in the first place.